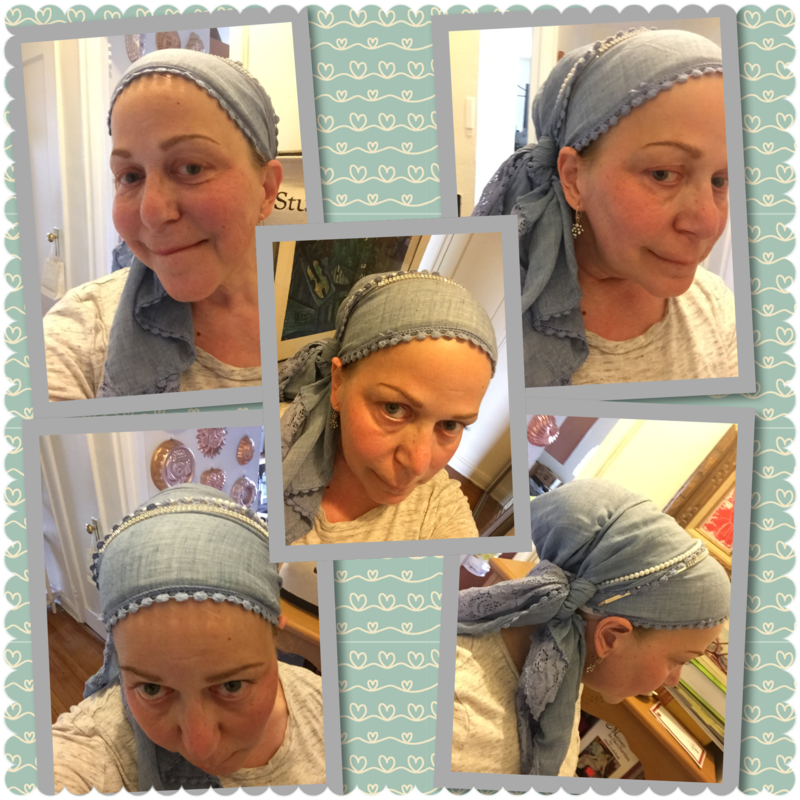 – Let your friends know, the ones who are intimidated by the super intricate scarf wraps, that this mitzvah is for THEM, and the whole point of Wrapunzel is liberation and letting everyone know that “you can do it!” You don’t have to be intricate/complicated to reveal your inner essence through wrapping your hair! … and now, let’s hear from Miri! Backstory: How’d you come up with #onescarfchallenge? I thought about wrapping my hair last summer, around the time our boys were kidnapped. I remember their beautiful mothers’ head coverings, and being so impressed with their poise in the face of such devastating tragedy. Their simple wraps were so beautiful, yet simple. I learned strength doesn’t always need a lot of ornamentation to be beautiful. Up until this point, I was pretty fluid in my hair covering. I’d been married about 10 years when my family became more observant and purposeful in our religious practice. I hesitate to label me or my family as “Ba’al tchuva,” because I believe I am the same person I’ve always been. Taking on mitzvot began in earnest when we moved to Rochester, NY, from LA, and joined my husband’s family’s Sephardi shul, Light of Israel. My son’s great great grandfather founded the shul, so our small family felt incredibly connected to the kehilla. Being in a small town, well, the smallest town I’ve lived in, we had the opportunity to develop our religious practices in a way that was very organic, and really couldn’t have happened anywhere else. I could try to find out how I wanted to cover my hair IF I wanted to cover my hair. Usually no one mentioned my flirtation with covering my hair, except to give me encouragement. During this time, I worked at a Catholic college as an assistant professor in communication, and felt like I couldn’t take many risks in the way I covered my head. I didn’t really even cover my hair in a non-religious setting until 2011 when I developed breast cancer at 45. At the time I had a five year old son and was looking for something that I could do to cover my bases spiritually, so to speak. I was sent to Israel for a professional conference, and couldn’t NOT cover my hair while I was there. This was also right before my bilateral mastectomy—covering my hair with hats seemed to be the thing to do to put myself in a good place spiritually. My husband follows R” Ovadiya Yoseph, so wigs were never part of the equation. Sometimes I’d wear a snazzy bandana, but usually I’d wear a hat or a biker ‘do rag. Still, I was searching for a personal head covering style. I went through cosmetology school in high school, so keeping my head stylish is a priority for me. Then I saw the person you know as Jennifer Michelle Ora Kreisler. She and I had known each other briefly, years ago, when we were part of the same speech team. I hadn’t given her another thought—until I saw this radiant rebbitzen sporting an amazing wrap on a mutual friend’s Facebook page. We danced around asking each other if we were Jewish… She had been a different person when I know her before (but I was too! ), and I just LOVED her wrap, but not only that—she encouraged me to try wrapping just by wearing beautiful wraps herself. If she could do it, I certainly could! I’m inspired by your story. Thank you for sharing, Miri. I’ve been a one scarf girl most of my almost 40 years of covering my hair and only in the last couple years branched out to more. . Thank you for reminding me that elaborate isn’t necessarily better. What a wonderful and beautiful story! Thank you so much, Andrea and Miri! Thank you for that story. I’ve lived in NYC, Canada and the west coast of the USA. I’ve been in big cities and suburbs and for the first time I’m living in a small town. Everybody talks here in Mayberry. I like the idea of toning it down too. If Andrea and Rivka walked through our town people would gawk. It would help that they were smiling and confident (like they always are) but the people here would still be mouth-breathing as they passed by, it would probably be written up in the 1 page local newspaper and then talked about for the next 3 years. I have a lot of scarves but your 1 scarf is a huge success. As I analyze your sweet looking face I notice that you have a good color for YOU. And your scarf is detailed with the fringes. And, there is a layer of lace built in so……………………….that means if we want to get a little more from one scarf then we had better look for one with a little bit going on…..added lace accents and you’re wearing a headband too. I feel like the country people around here would LIKE you at first sight. It’s not that they wouldn’t like Andrea and Rivka it’s that they would be so dumbstruck that I believe they would exhibit bad manners. Whereas with you I feel they might want to know where you got your scarf and how they could get one too. I have a pink one that does that. It’s part light pink cotton and part lace so I get that same effect. It looks great as a “one” scarf. Don’t think that I’m putting Andrea and Rivka down at all. I’m not. I like them both a lot and have been following Andrea’s YouTubes for a long time now. I’m only speaking to this small town where they are hooked on jeans, T-shirts & country music. They don’t wear skirts here either. I look like a true hippy everywhere I go. I do wrap my head sometimes and just let them deal with it. I always wear a skirt and I always wear a headcovering. I don’t go anywhere bareheaded for the last 25 years. But for their un-cosmopolitan sensibilities I try to keep my covering calm and even then they stare. I will be “that new woman” for the next 25 years and I’m reconciled to that. They are friendly in their own way. A friend of mine just had surgery so she is struggling to wrap her hair right now. I’ve given her a simple cotton beret and then told her when she is “back” she can use that beret as a scarf gripper and get back to the kinds of wraps she likes. This is a really neat post. Options are GOOD because some people are uncoordinated or fresh out of surgery or live somewhere funny, or their arms and shoulders are injured. Thanks for this post. And Andrea/Rivka I love you both too and all of your looks. Every order I get from you is THE best stuff and great prices and great customer care too. I hope you don’t sell your business to some heartless, big company. Totally agree with everything you said!!!! Thank you, Miri. May you have a refuah shleima in the merit of your expansive thinking. You are so right that none of us need be intimidated, especially in this accepting and nurturing environment, and you’ve taken action to validate everyone. Kol ha kavod! I hope to be posting a “one scarf” pic soon. Will post on Face Book, in a few minutes…. I have myalgic encephalomyelitis, which causes me a lot of pain. I find myself restricted to one scarf pretty much all the time, so I really appreciate your story and inspiration. I wish us a refuah sheleimah, and long life to 120 in Torah and mitzvot. LOVE this story! Had no idea of the background behind the onescarfchallenge – can’t wait to try it myself! Miri <3, What journeys we have had together and apart. Thank you for it all! One of the "Intricate" wraps you were wowed by is only one scarf even without adornment 😉 . I began with a self made volumizer (Made from a stuffed kid's chef's hat) …and a cute beaded dress I twisted around my head. I played until I felt my own creativity didn't wear me but I wore it. (I didn't want to be a scarf walking around….) I wanted to have me ~with something that said something about me. I must say that my favorite wraps are typically my simple waffle weave, light scarves. gauzy-thin and extra long so I have room to twist, but can keep it as plain as can be as well. Whatever one chooses to wear they have to feel like they can move– play– work– dance– bake…. whatever! Sometimes 2 or 3 or even 4 is fun!… but me, I typically go with just one. You have come a LONG way-baby! May you keep your path of health, strength and inspiration. May you be a catalyst for mitzvot! No one should get the impression that it’s not for them just because they’re new to hair wrapping or have bad motor skills or can’t wear too much weight on their heads or lack time in the morning or don’t have many scarves or prefer a more simple style or… whatever. I don’t have a facebook account (nor twitter, nor instagram), so I can’t “officially” participate, but I have been wearing one scarf with a pin today – not because I was in a hurry, but because I like the idea. And I’ll probably do it more often, because… it made me think that some days something elaborate and intricate can be really beautiful, but some days it can also distract, and then, something simply does the job of revealing essence (as Andrea called it) much better. Well. I got carried away, so this comment is longer than I intended. But, not to forget the most important thing: May you have a full recovery! You’re so wonderful – agree with everything you said! THANK YOU! Thank you so much for sharing your story, I am so inspired by you!